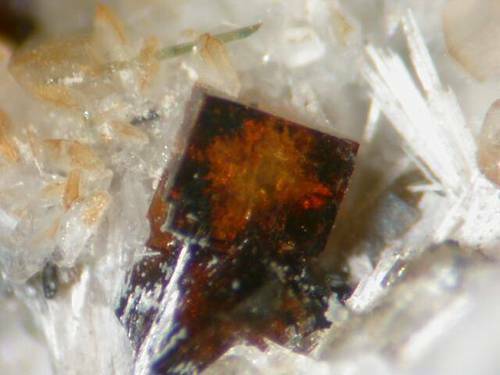 Neighborite: Mineral information, data and localities. 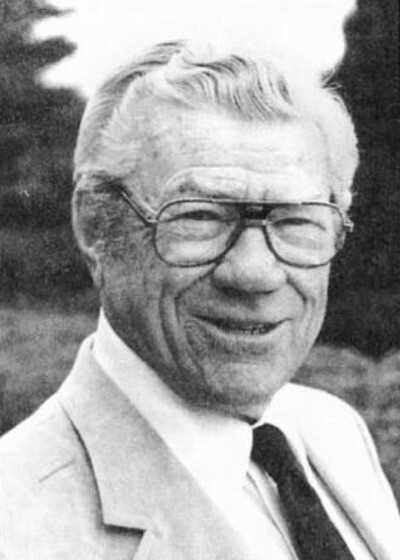 Named in honor of Frank Neighbor (1 December 1906, Harper, Kansas, USA - 13 January 1996, Casper, Wyoming, USA), Sun Oil Co. geologist, Salt Lake City Utah. He made the drill cores, in which the mineral was discovered, available for study. Related to the K analogue, parascandolaite. Chao, E.C.T., Evans, H.T., Skinner, B.J., Milton, C. (1961) Neighborite, NaMgF3, a new mineral from the Green River formation, South Ouray, Utah. American Mineralogist: 46: 379-393. Siderite 15 photos of Neighborite associated with Siderite on mindat.org. Aegirine 14 photos of Neighborite associated with Aegirine on mindat.org. Gaidonnayite 10 photos of Neighborite associated with Gaidonnayite on mindat.org. Elpidite 4 photos of Neighborite associated with Elpidite on mindat.org. Pyrrhotite 3 photos of Neighborite associated with Pyrrhotite on mindat.org. Quartz 2 photos of Neighborite associated with Quartz on mindat.org. Rémondite-(Ce) 2 photos of Neighborite associated with Rémondite-(Ce) on mindat.org. Rutile 1 photo of Neighborite associated with Rutile on mindat.org. 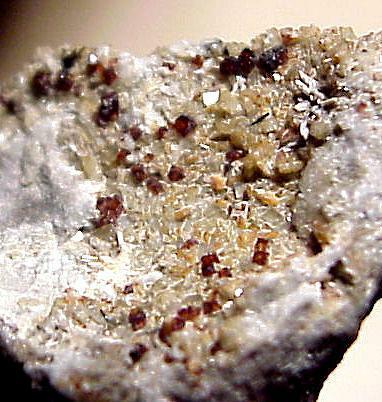 Natrolite 1 photo of Neighborite associated with Natrolite on mindat.org. Fleischer, M. (1962) New mineral names. American Mineralogist: 47: 805-812. Mineralogical Record (1990): 21: 325-326. Lütgert, B., Babel, D. (1992) Kristallstrukturverfeinerungen an natriumtrifluorometallaten NaMF3(M= Mg, Co, Ni, Zn): Oktaederkippung und toleranzfaktor orthorhombischer fluorperowskite. Zeitschrift für Anorganische und Allgemeine Chemie: 616: 133-140. Pischedda, V., Ferraris, G., Raade, G. (2005) Single-crystal X-ray diffraction study on neighborite (NaMgF3) from Gjerdingselva, Norway. Neues Jahrbuch für Mineralogie, Abhandlungen: 182: 23-29. Chen, J., Liu, H., Martin, C.D., Parise, J.B., Weidner, D.J. 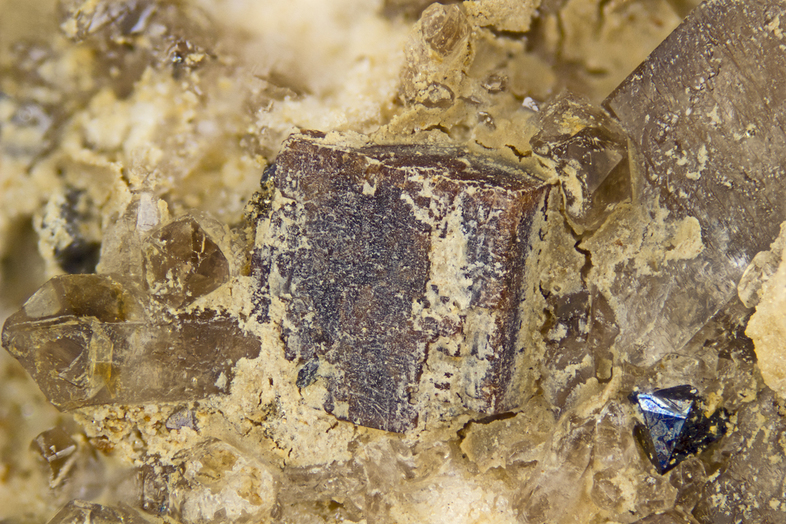 (2005) Crystal chemistry of NaMgF3 peroskite at high pressure and temperature. American Mineralogist: 90: 1534-1539. Piilonen, P.C., Rowe, R., Ercit, T.S., Locock, A.J. (2006) New mineral names. American Mineralogist: 91: 1452-1457. Martin, C.D., Crichton, W.A., Liu, H., Prakapenka, V., Chen, J., Parise, J.B. (2006) Rietveld structure refinement of perovskite and post-perovskite phases of NaMgF3 (Neighborite) at high pressures. American Mineralogist: 91: 1703-1706. Mitchell, R.H., Alexander, M., Cranswick, L.M.D., Swainson, I.P. (2007) A powder neutron diffraction study of the crystal structure of the fluoroperovskite NaMgF3 (neighborite) from 300 to 3.6 K. Physics and Chemistry of Minerals: 34: 705-712. Knight, K.S. (2014) A high-resolution powder neutron diffraction study of the crystal structure of neighborite (NaMgF3) between 9 and 440 K. American Mineralogist: 99: 824-838.
http://maurice.strahlen.org/kola/khibiny.htm; Barkov, A. Y., Fleet, M. E., Martin, R. F., & Men'Shikov, Y. P. (2006). Sr-Na-REE titanates of the crichtonite group from a fenitized megaxenolith, Khibina alkaline complex, Kola Peninsula, Russia: first occurrence and implications. European journal of mineralogy, 18(4), 493-502. Khomyakov, A.P. (1995): Mineralogy of hyperagpaitic alkaline rocks. Clarendon Press, Oxford, 223 pp. ; Yakovenchuk, V.N., Ivanyuk, G.Yu., Pakhomovsky, Ya.A., Men'shikov, Yu.P. (2005): Khibiny. Laplandia Minerals Ltd. (in association with the Mineralogical Society of Great Britain and Ireland), Apatity, 468 pp. Pekov, I. (1998) Minerals First discovered on the territory of the former Soviet Union 369p. Ocean Pictures, Moscow; Pekov, I. et al (2003): New Data on Minerals: 38: 20-33. P.M. Karashov data; Savel’eva, V. B., Bazarova, E. P., Khromova, E. A., & Kanakin, S. V. (2017). Fluorides and Fluorcarbonates in Rocks of the Katugin Complex, Eastern Siberia: Indicators of Geochemical Mineral Formation Conditions. Geology of Ore Deposits, 59(7), 561-574.